When you look at this picture, do you see a building with wood-framed construction stucco, vinyl window frames, clay tile, and cheap, painted wood numerals? Of course. But many architects also see a building through the lens of architectural history. When a friend moved into this building, I posted this lighthearted critique on Facebook. This an under-appreciated architectural gem exemplifies the transfer of the finest Southern European traditions to Southern California. Consider, by way of exposition on this theme, how the symmetrical, tripartite facade of the upper story projects beyond the lower representing the defenses typical of an Italianate tower, a theme further expressed by the use of terracotta tile on the pseudo-Mansardic attic story. Yet the tetrastyle engaged pilasters have the Mannered confidence of Michelangelo's Biblioteca Medicea Laurenziana. While realized at a somewhat smaller scale, the groomed arboreal forms in the landscape are based on the finest traditions of royal gardens. The sinuous line at the intersection of earth and structure is the mark of a master. It is unfortunate that this edifice has been stripped of the ashlar marble cladding that undoubtedly defined its exterior. The mean rendering, however, discloses its pure lines and anticipates the austerity of the Villa Savoye. We must not overlook the aesthetic tension introduced by the deliberate use of anachronistic serifs on the cartouche, leaving us to ponder why the builder chose to memorialize the defense of Constantinople during the indicated year. The post received "Likes" from many of my friends that are architects, suggesting that they recognized it as a sendup of architectural thinking. Bottom Line: When preparing marketing communications for a building product, it is useful to understand all the ways architects think. I got 20+ solid leads during a two-hour networking event this week. Sponsored by a CSI Chapter, there were about 45 table top displays from building product companies, and over two hundred attendees. The leads were generated by brief contacts in the exhibit space, in the lobby outside the meeting space, and even in line for the parking lot attendant afterwards. The leads created opportunities for follow-up phone calls or emails or generated new leads and introductions. On top of that, I got to say hello to dozens of other industry contacts to keep our relationships fresh. 1. Know your goal: I went to the CSI event with the intent to interact with a lot of people, and I succeeded. But I may have had other purposes in mind. For example, I went to a party at a trade show for the specific purpose of meeting a potential client that I anticipated would be there. He was, and I was able to get him to join me for a full hour at a table on the periphery of the event. 2. Be prepared for surprises: Be ready to change your goals as opportunities or circumstances arise. I was at one conference, anticipating an afternoon of glad-handing, when the conference organizer approached me and asked me to be on a panel discussion in place of someone that cancelled at the last moment. Instead of 20 1-on-1 conversations, I addressed an audience of 200. At another event, I was drafted to serve at the registration desk, and got to introduce myself to everybody at the show. 3. Ask others questions about themselves: You are itching to talk about your product or service. But start by asking others about their businesses, their families (if you have a personal relationship), or any new products/projects they have. Networking has to be a win-win situation, and your interlocutor must feel a stake in the conversation. More, his or her comments may reveal needs or opportunities that are openings to sales opportunities. 4. Get to the point: Everyone at the event is there for networking. So forget the small talk during business hours; save it for receptions and the lounge. 5. Get contact info and set up a follow-up: Carry more of your own cards than you think you will need. But be sure you know how to contact the person with whom you are speaking. Get permission to recontact the person when possible. This could be as simple as saying, "I'll send you XYZ with more info." or, "Would it be better for me to call you tomorrow or later in the week?" Networking creates an opportunity and strategy to build and maintain relationships with current and prospective customers. Networking involves more personal commitment than company money. No matter how busy we are, we all still need to make time out of our schedule to network. It requires dedication on an individual level. This webinar will examine specific ways you can expand your network for yourself and your company. If you are not an exhibitor at or sponsor of the event, don't be a carpetbagger. It may be a fine line, but there is a difference between doing sales and networking. If you are networking with an exhibitor for purposes other than learning about his or her product, do it only when there is not a real prospect in or approaching the booth. Tweet, text, post, email -- all have applications in building product sales. But the sound of a voice, with the ability to sense tone and inflection, to listen and share, in real time duplex communication, fosters connection not available in other social media. I am reminded of this by feedback I got from "Tim", a client of mine. Tim called last week and asked for my advice on the pricing he charged a long-time customer. Tim had bought his way into the customer's vendor list by underpricing his services. The pricing strategy made sense, at first, since Tim had excess capacity and was seeking an entry into a new market segment. But now, Tom was operating at full capacity, was firmly established as a preferred vendor in the segment, and had even improved the product. We reviewed his options and agreed that a significant rate increase was justified. But when Tim said he would send the new rates via email, I stopped him. You see, Tim had never had a face-to-face meeting with his customer. In fact, had never even spoken with him by phone. Their only relationship was based on price. I told Tim, "If you send it by e-mail, all your customer will see is the price increase. You need to speak with him directly. Tell him how much you have appreciated his business and ask him if he is satisfied with your work and what improvements you could offer. Only then can you explain why a price increase is necessary and point out how you have been providing extra value not offered by other vendors. By being in conversation, you let your customer express any concerns about the new costs so you can look for a win-win situation." Tim said he felt awkward about speaking with customers -- that is why he had built his business service model around internet and email instead of direct selling. I understood, but urged him to work outside his comfort zone to see what would happen. Since the customer is on the other side of the country, making a face-to-face meeting impractical, I urged Tim to phone the customer. "Your seat-of-the-pants insistence (or so it seemed, to me) that I not send an email but instead talk on the phone with my guy in NYC surely made this a different process from what it would have been, had I done things from "my will." Changed behavior led to improbable outcomes: For the first time in memory, in a significant way I have asked for what I need, and I got it." Photo is public domain and accessed at Wikimedia Commons. I was researching a media-buy for a client, and while perusing a trade magazine's media kit, I came across an impressive statistic: 90% of the people they surveyed read their magazine. Only about 50% of those same folks read the next most popular magazine in that field. Sounded great. Except that I like context. So I wondered, who exactly were the folks they surveyed? It turns out it was a survey of their 14,000+ readers. It turns out only 90% of their readers actually read their magazine, and 94% of their readers receive their magazine. This leaves me wondering how they define their readers, since (if you consider their own statistics and use the kind of meatball logic they used) there seem to be some "readers" (6%) who neither read nor receive their magazine. It did not leave me wondering about the quality of their statistics: I now believe very little of what they say, not without close scrutiny. Clearly, they did not intend me to take away the message that their magazine is so boring that 10% of their own readers don't even read it. Clearly, what they intended was for me not to read the fine print. Did you really think I wouldn't read the fine print, guys? Did you really think I'd just look at a big number and take out my checkbook? Personally, I think it would have been wiser to craft a different headline out of their survey data. They could have ignored the percentage of their readers read their magazine (that still twists my brain) and focused on the 50% of them who read only that magazine, out of all the publications in their field. If you're talking to me as a potential advertiser, the idea that the only way to reach those 7000+ people is through your magazine is pretty compelling sales-stuff. Much more compelling than the admission that your "readership" figure is inflated by 10%. More to the point, their assumption that I wouldn't question their headline, that I wouldn't read the fine print, insults me. It insults my intelligence and my competence at buying media. Insulting your potential customers is hardly ever a good place to start, even if you're a stand-up comedian. This is a lesson for anyone who designs or approves advertising and sales literature. If you assume the audience is stupid or lazy, you will pay for it. It will reflect badly on you, and invite speculation on what other kinds of deception you practice. Forgive the pun title for this post -- but it this illustrations brings two topics to mind. 1. Mining is a huge market for construction materials! It is frequently overlooked by building product manufacturers more tuned into above ground construction. Mining -- particularly underground mining -- requires concrete and other structural materials, lighting and communications, plumbing and ventilation, tools and equipment, and more. Most products used underground have to meet severe service conditions including dust, moisture, physical abuse, and fire/explosion resistance. Yet many of our clients have found that, with appropriate product modifications and a disciplined sales and marketing effort, new opportunities can open beneath their feet. 2. A good illustration is an invaluable sales tool. When I had had to learn about the mining business in a hurry, I realized I was in over my head. It began opening to me when I found this illustration, in Shotcrete magazine. Within minutes, I was able to grasp important mine construction concepts and familiarize myself with terminology. This recent post on Advertising Age has nothing to do with building products specifically, but everything to do with creative ways to raise awareness. Many of the "10 Most Unusual Advertising Placements" are examples of brand awareness advertising (as distinct from promoting a specific product). A couple are really advertising venues in search of an advertiser. What they all share is a clever rethinking of where to contact the potential customer. The best of these ideas not only find a clever way to get noticed, but feature a fundamental appropriateness of the location they operate in, and a real connection between the way they communicate and the brand/product being advertised. Anyone could imprint their logo on the thighs of someone wearing shorts who sits on the bus-bench in #5. The brilliance of it is using it to advertise a sale on shorts. The same technique might also work for a gym, or a campaign for women's rights. It wouldn't make much sense for a car company, though, and it might be downright negative for a brand of canned ham. Human communication is increasingly visually driven. Digital cameras, shooting still and video, are everywhere, and everyone knows how to use them, so visual instructions and explanations are becoming ubiquitous. Shooting a video to explain an idea or process is tempting, because everyone seems to want visual communication. However, a video of someone reading an explanation isn't really "visual." It's just Text in Video clothing. Truly visual communication is a a very different animal. Sometimes, a good old-fashioned graphic, or a clever, new-fangled interactive graphic, can do the job very nicely, where a video might be quite a challenge to execute effectively. Here are two examples that each tackle the concept of giving scale to large numbers and sizes. $100 bills representing Goldman's derivative exposure. 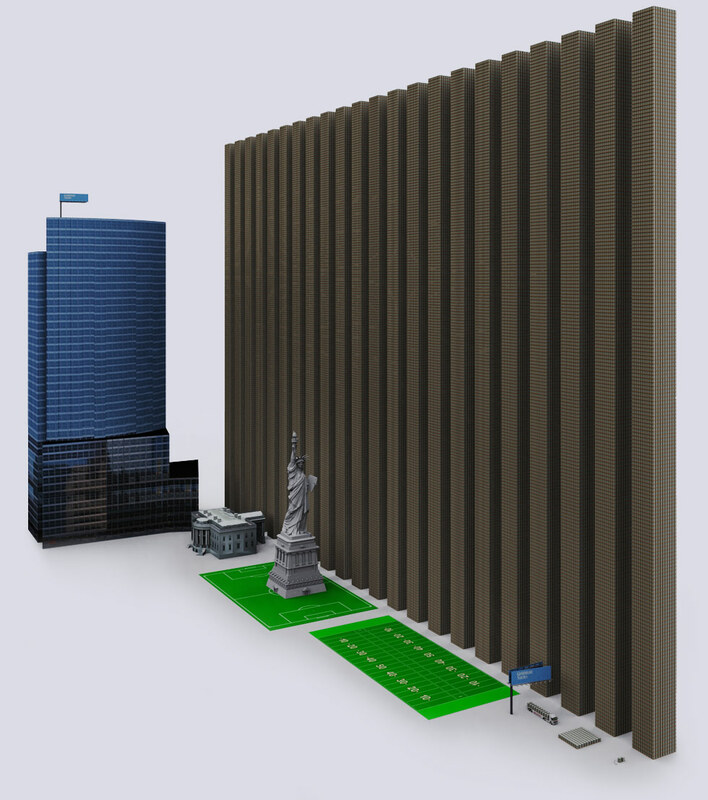 Each tower is $1 Trillion ($1,000,000,000,000). This page uses flash to let you "scroll dimensionally" in and out of size, from the size of quantum strings up to the estimated diameter of the universe (as distinct from the smaller diameter of the "known universe"). Both illustrate the concept of scale very effectively. They also offer the viewer the ability to dwell over them as needed to comprehend what they are saying, a measure of control that videos distinctly lack (as in, "Yeah, I already know that, move on to the next thing."). They also illustrate the value that a good graphics designer can have to enhance your marketing efforts. Ceiling's Plus' "You Wood If You Could" advertisement is a finalist in Architectural Record's 2012 Advertising Excellence Awards. Architectural Record tends to attract the best, most thoughtfully designed and altogether tasty advertising in the construction world, providing what the magazine publisher calls "stiff competition." According to Laura Viscusi, VP of McGraw-Hill Construction Media (which publishes Architectural Record and SNAP - the ad appeared in the latter publication), the finalists were picked from 170 ads. "This is no small feat, the ads get better and better every year." The ad was also the top response-generator in SNAP, a measure of effectiveness which we find perhaps even more gratifying than an award nomination. It was designed by Chusid Associates; Steve Klippenstein, Art Director; Steven H. Miller, Copywriter; Michael Chusid, Account Executive, for client Nancy Mercolino, President of Ceilings Plus. Winners of the 2012 competition will be awarded at the Excellence in Advertising Awards Breakfast will be held on Friday, May 18th at the Grand Hyatt Washington, in Washington, DC, during the 2012 AIA convention. Type the name of your company or brand. How many of the characters are typed with the right hand? With the left hand? According to recent research related to QWERTY keyboards, words typed primarily on with the right hand are associated with greater positivity than are words typed primarily with the left hand. The QWERTY keyboard mediates communication for millions of language users. Here, we investigated whether differences in the way words are typed correspond to differences in their meanings. Some words are spelled with more letters on the right side of the keyboard and others with more letters on the left. In three experiments, we tested whether asymmetries in the way people interact with keys on the right and left of the keyboard influence their evaluations of the emotional valence of the words. We found the predicted relationship between emotional valence and QWERTY key position across three languages (English, Spanish, and Dutch). Words with more right-side letters were rated as more positive in valence, on average, than words with more left-side letters: the QWERTY effect. This effect was strongest in new words coined after QWERTY was invented and was also found in pseudowords. Although these data are correlational, the discovery of a similar pattern across languages, which was strongest in neologisms, suggests that the QWERTY keyboard is shaping the meanings of words as people filter language through their fingers. Widespread typing introduces a new mechanism by which semantic changes in language can arise. How does the word "feel"
The research raises many questions that should be explored before we understand the implications of handedness on marketing. BASF, a firm with many building product brands, has prospered despite being typed entirely with the left hand. Pulp, a specialty glass manufacturer, cannot attribute its growth exclusively to being typed entirely with the right hand. It is only in the past few decades, since the widespread acceptance of personal computers, that QWERTY has become such an important form of mediating communication; it is already on the decline among young folks who text with their thumbs, and future technologies may render it obsolete. consider how it feels to type. Your customers may be typing the name more frequently than they speak it. So the feel of typing the word must be considered along with the sound, look, and meanings associated with it. Photo by MichaelMaggs, http://en.wikipedia.org/wiki/File:QWERTY_keyboard.jpg, accessed 2012-03-10, and used under a Creative Commons Attribution-Share Alike 3.0 Unported license. Publicity is a hard thing to track, as we have often noted here, so we like to report the anecdotal evidence that we find. Recently, we published a 4-part blog post about ten innovative trends in building materials and construction that we think are worth watching. We also sent out a special edition of our e-newsletter, reporting the 10 trends and linking to the blog. This is, however, the first edition of our e-newsletter where we have included our editorial contacts on the mailing list. Why didn't we think of that earlier? The same morning that the e-newsletter went out, it was picked up and reprinted by Environmental Design and Construction, a major print and digital magazine. Magazines, both digital and traditional, are hungry for content. A press release or a contributed article is a great, cost-effective way to tell your story, in depth, to thousands of people who want to read it. NPR has been gracious enough to make its Social Media Policy available online. While much of it is centered around ethical journalism, building product manufacturers would do well to examine it. As more and more relationship-building happens online, companies need to participate, and to do so wisely. Imagine, if you will, an NPR legal correspondent named Sue Zemencourt. She’s a huge fan of Enormous University’s basketball team and loves to chat online about EU. She posts comments on blogs under the screen name “enormous1.” One day, an equally rabid fan of Gigormous State (“gigormous1”) posts obnoxious comments about EU. Sue snaps. Expletives and insults fly from her fingers on to the webpage. They’re so out-of-line that the blog blocks her from submitting any more comments — and discovers that her i.p. address leads back to NPR. The blog’s host posts that “someone at NPR is using language that the FCC definitely would not approve of” and describes what was said. Things go viral. Be circumspect about your behavior, even when the exchange feels private or anonymous. Even an email to a trusted recipient can be made public, with or without the recipient’s knowledge or consent. In fact, a big part of the chapter on "Honesty" is, in fact, the putting on and taking off of the work identity. Because many NPR employees use their real names on the radio, they're encouraged to use screen names that don't identify them in the personal realm. And when they're off duty and they find themselves working, they must put their work identity back on. If in their personal lives NPR journalists join online forums and social media sites, they may follow the conventions of those outlets and use screen names that do not identify who they are. But we do not use information gathered from our interactions on such sites in our reports for NPR. If we get ideas for stories, we treat the information just as we would anything we see in the “real world” — as a starting point that needs to be followed by open, honest reporting. Your business, even if it's far less public, may wish to explore policies about how employees present themselves in their off-work interactions. For instance, American Widget Co. may decide to allow its product reps to use their real names online in private, but ask that they not identify their employer in their Facebook or other profiles. Or, they may simply prohibit the use of AmWidget or AWC in screen names except for social media used for business. By the same token, when representing Widget, employees should make that clear in their profile names and follow the company's communication policies. We rely on the contributions of every NPR journalist to ensure this handbook remains current and relevant to the situations you face each day. If you encounter decisions for which you feel the guidance in this book is inadequate, have questions about interpreting what you read here, or suggestions for how to improve the handbook, we encourage you to send a note to Ethics. Twice a year, the Standards and Practices Editor will convene an ethics advisory group to consider all suggestions, review the Handbook, and make any additions or revisions necessary. How do you want to be seen online? Take a look at your company through this lens and see if you're inspired to make any changes to your social media policies. When selling in Mexico, it helps to speak the language they hablan there. ¿Habla usted de la construcción? Or to be fluent in Française when making a pitch in Quebec. Speak Specifese, the language of specifiers and contractors! Specifiers and builders, like people everywhere, appreciate it it when you attempt to address them in their native tongue. Now, you can learn Specifese even if you have never studied a second language before. In fact, many individuals become proficient in Specifese in under three months. Language immersion classes are forming right now, at Construction Speaking Insiders (CSI) clubs around the country. Members of the club take pride in their achievement; displaying the initials of the club's slogan,"Communicate, Don't Talk through your hat"* (CDT) after their names. Impress your friends and family, and even your boss. But hurry, this opportunity ends at the end of this month. Act today, and get FREE CDT Study Guide. *The phrase "talk through your hat" means talking about something without knowing much about it. "Made You Look" isn't just a schoolyard game anymore, it's become a business survival tactic. The above image, for example, has nothing to do with building products, but a great deal to do with the concept of getting someone's attention. Publicity is the business of getting attention via existing channels of "news" communication. Each year as World of Concrete approaches, editors get deluged with emails from exhibitors who are holding press conferences. The goal of these press conferences is to get editorial coverage (magazine, web, Better Homes & Gardens network, etc.) of your product, so you can get some public or trade attention to it. But first, you have to get the editor's attention, and get him or her to the press conference. We have a client holding a press conference at WOC, and wanted to invite editors. The question was, how to make it stand out from all the other emails inviting editors to press conferences. We decided a) to be different. All the others seemed emphasize the company's name and reputation, but give very little info, in fairly small type, about what would be discussed at the press conference. By contrast, we decided to talk to editors about what they care about: the story. To an editor, the gift they seek is not the Company, it's the news. Our invitation screamed that there was news, from the subject line on downwards. It didn't tell all the news, but it told enough that an editor could be sure there was a solid story to come and collect. It also mentioned the company bringing this news, the giver of the gift. We decided b) to be colorful. In most of the other emails, the only color was the company's logo. That may be a big ego boost for the company, but it left the rest of the email, including the "news," looking kind of drab. We stuck in honkin' bright pictures of products and results, not a lot of them, but a selection that was standing-up-and-cheering with color. Colorful pictures get anyone's attention, but especially an editor who needs colorful pictures to put in the magazine. Two hours and four minutes after the email went out, we received a response, apologizing for having to miss the press conference, but asking to set up an interview instead. Ahhhhhhhh! Today's communication environment is extraordinarily competitive. It's an invitation to be creative. Of course, you shouldn't do irrelevant stuff - such as the above image - when you could just as well offer up your real story in a creative way that gets attention, and proves that your story is attention-worthy. And it's fun to play Made You Look. The new year will be the year of mobility... when the constraints on the flow of data into and out of the field, and the use of mobile devices to collect, share and present it, give way for good. Almost everyone on construction jobsites carries a smart phone or other computerized device. This offers great new avenues for building product manufacturers to communicate with customers. Your shop drawings, installation instructions, training videos, and other information has to be accessible. Consider the impact on your distribution strategy, sales management, and customer service. ...relatively inexpensive Tablet PCs running Android and the forthcoming Windows 8, challenge Apple's iPad and iPhone for business use in the field. Your field reps will have to be similarly equipped. ...independently created and relatively inexpensive apps will continue to compete with, and sometimes challenge the capabilities of more expensive, old-school, licensed software. "Independently created" means "provided by building product manufacturers." Move beyond providing materials to offering tools the contractor can use to run his or her business. Three-dimensional printing of models and components will become commonly used tools. Imagineers will design, model, and print in 3-D to test and communicate ideas, and then build for real. This will first happen in design offices. Some manufacturers use this for rapid prototyping of parts. In other cases, actual parts are now "printed." The "Internet of Things" will grow exponentially and have a direct impact on design, engineering, construction and facilities management, as embedded sensors, cloud-based analysis and rapid data exchange turns our deaf, dumb and blind structures into introspective communicators. How will you build intelligence into your product? ...expect the challenge of capturing, storing, sharing, managing, analyzing, interpreting and presenting the "big data"—that vast collection of information piling up as a product of all of that sensor data collection and analysis, to grow as well. Intelligent machines are great at capturing, storing, sharing, and managing data, but human beings are still best for analyzing and interpreting a problem and presenting solutions. This means your sales reps must still earn the trust of customers. In response, look for a drive to simplify data delivery through browser-based interfaces, neutral file formats and innovative visualization. Don't leave this to your IT guy. Make sure your marketing communications team leads the charge. In short, look for an exciting year ahead. Tout is new Twitter-like communications channel for VIDEO. 15 second messages. Today, I saw about a dozen short clips, apparently from an architect showing the contractor (or owner?) things that needed to be fixed on the project. This could be a great way for a building products manufacturer to offer brief tips and ticks, and more important, to handle tech support inquiries. Open a channel. Print your TOUT tag on all your product packaging, so your customers will know how to reach you. Use you existing outreach channels - including your packaging - to encourage customers to put their issues on short videos and send them, so you can monitor the channel and provide answers. A quick visual demo may be enough to resolve the issue. Or else, you can answer by telling the person to call you directly for a detailed discussion. It puts correct information out into the Toutosphere (which is small now, but could easily go big) and shows that you're there for your customers all the time. Naturally, this means you have to have someone monitoring Tout for you - either someone in house, or your outside PR agency perhaps. Social Media is about being engaged, after all. Robert's Rules of Order was compiled by an engineer. Building product salesmen, like engineers, ought to be prepared to participate in "deliberative assemblies," to use Robert's elegant phrase for meetings where a group considers and democratically decides on a course of action or policy. As Robert's found, being able to conduct a business meeting effectively is a form of service to an organization. It can also enhance an individual's reputation and afford leadership opportunities that can aid one's career. I am reflecting on this following the recent Annual Meeting of the Construction Specifications Institute (CSI). A simple motion from the floor devolved into confusion that delayed the meeting and frustrated members. This would not have been the case if the meeting had been assisted by an able parliamentarian or if the members had a better understanding of the rules of order. Rules of order are similar in function to MasterFormat's Division 01 - General Requirements; both describe administrative and procedural requirements to be followed in order to achieve a goal. Conducting a meeting is far easier than managing a construction project. While CSI's meeting was tumultuous, the members were still able to approve the motion in question, with a substantial majority voting in the affirmative. Familiarity with parliamentary procedures will enhance your participation in professional and trade associations and committees and in community affairs. To learn parliamentary procedures, I recommend reading Robert's Rules of Order Newly Revised IN BRIEF, a clear, concise, and correct guidebook that is complete enough for use most meetings. I also recommend The A-B-C's of Parliamentary Procedures, a pamphlet that explains basic rules and is priced so that copies can be affordably provided to all members of an organization. Roberts worked with the US Army Corps of Engineers, eventually becoming its Chief of Engineers. Among his many civil engineering works were improvements to waterways. Yet his greatest achievement was to improve the flow of group decision making and to drain the swamps of debate. It is altogether fitting that contemporary members of the construction industry follow his lead. This is an encore of an article Michael Chusid wrote over 20 years ago. "Productware" is now firmly established, and our attention has turned to identifying new trends that will shape building product marketing in the decades ahead. The future is hard to predict -- this article failed to foresee the internet, for example. Building product manufacturers must be able to speak the language of the architectural community. With a majority of architectural firms now using computers for everything from code analysis to working drawings, many manufacturers are rushing to learn the language of automation and its marketing dialect. To date, the number of manufacturers using computers as a new sales communication medium is still relatively small. But as the computerized customer base reaches a critical density, more manufacturers are realizing that the medium can be an effective method for reaching targeted markets. I refer to computerized building product sales tools as "productware." The first productware to be developed has been electronic versions of existing guide specifications and product details. By eliminating the chore of inputting data, manufacturers are hoping their diskettes will find a way into an architect's, library of master specifications and standard details. It is fairly simple to translate a guide specification into the variety of word-processing systems most commonly used by specifiers. But it remains an expensive proposition for manufacturers to create easy-to-use libraries of CAD details, especially since data cannot be moved directly between some of the most widely used CAD systems. While diskettes with specifications and details can save an architect valuable time, a more significant use of the computers power lies in the development proprietary product-selection databases, expert systems, and engineering programs. These programs typically present a user with a menu of product performance parameters. Based on the user's input, the computer then searches a database of the manufacturer's products and systems and offers recommendations about the most appropriate products to use. Some programs can then produce a custom specification or schedule. And if an architect needs assistance in evaluating alternatives, many programs also offer interactive product tutorials. Products for which this type of manufacturer produced software is available range from laminated glass and fire stopping to luminaries and ventilators. When properly programmed, productware should do more than just sort data. It should help designers and specifiers become better decision makers. The rampant growth in building technologies and changes in product availability can contribute to decision-making anxiety. Productware can help relieve this syndrome by performing data-crunching tasks. Producing and distributing productware on their own, manufacturers can also place proprietary information in one or more of the product-information systems now available or under development. 'The difference and buying space in a product information system is analogous to the difference between a manufacturer distributing product notebooks and going into Sweet's Catalog File. A product-information system offers features like indexing and expanded product search capabilities but requires the manufacturer to adhere to prescribed formats. Until the nascent computerized product data systems become more widely subscribed to, they pose a difficult marketing dilemma for manufacturers. When will the time be right to buy "advertising" space in a computer database? Which of the emerging databases will survive the inevitable shakeout to become dominant in the market? Are databases in addition to, or replacements for, traditional product literature? How will the systems affect the role of the sales representatives? Another preliminary marketing observation is that productware can be used very effectively in direct-mail advertising. Conventional direct mail brochures and letters can be easily overlooked, but few architects can resist the temptation to stick a new diskette into the computer to see what it can do. One feature of the new product- information systems that has caught the attention of manufacturers is their ability to carry on two-way communications between suppliers and specifiers. Most of the systems under development have provisions to collect feedback about how often a manufacturer's products are called up from the database and on what projects they have been specified. Before these systems achieve widespread acceptance among architects, their publishers will have to assure users that sensitive project and client information will remain confidential. Also, users will want assurances that the systems' lead tracking will not bring an unwanted flood of calls from salesmen, Still, the benefits are significant: The on-line communications capabilities of some systems can be used for electronic order entry and have the potential for data sharing among designer, dealer, manufacturer, contractor, and facility manager. If productware fulfills its promise of improved access to data, better communication and decision making, and increased efficiency, then architects stand to gain. Architects need to help manufacturers understand the impact computers are having on practices and encourage companies to develop the types of productware that will help us get full benefit from our computers and from their products. As we have been predicting, QR codes are arriving at some sort of critical mass in the US, and suddenly, you see them everywhere. Home depot has them on store displays. They’re on the news. A headstone maker is putting them on gravestones. They may look like a maze puzzle to you, but to a smart phone with a (free) QR-reader app, they are a link to information, like a bar code on steroids. It is possible to pack plain text directly into a QR code, too. For example, the really dense QR code depicted here contains the first two paragraphs of this post. What is it worth to building products manufacturers? For starters, you could link all your product data and online instruction videos to a QR code right on your product packaging. A contractor shopping at the distributor’s warehouse could find out everything he needs from the most accurate source: you. On the jobsite, he could access instant video instruction for workers. You could link him to customer service and technical support just as easily. You can put a QR on your business card, too, for direct link to your website. For the time being, while QR codes are still a novelty, they offer tempting guerrilla marketing opportunities. People will be curious and scan them just to find out what they link to. Print them on cards and leave a few at big job sites, on Home Depot shelves, at union halls. You can print them on stickers and find interesting places to attach them: a hard hat, a tool box, a product package. They won’t be novel for long, though. Acceptance is moving rapidly. Two clients of Chusid Associates have won this year's Excellence in Construction Information Awards, jointly sponsored by CSI and Specification Consultants in Independent Practice (SCIP). Ceilings Plus was recognized for its Idea Box, an innovative presentation of product data and samples. American Decorative Concrete Supply Company (ADC) was awarded for their sales collateral and product documentation. The EICI Award was created to recognize excellence, originality or creativity in processes, tools, or documents used in development or construction of the built environment. Michael Chusid accepts awards for two clients during 2011 CSI Convention. ADC embarked on an extended communications project in 2010, revamping all their product literature to make it more useful to architects and specifiers and well as contractors and concrete artists. The campaign includes sales sheets, technical data sheets, and guide specifications, as well as a redesign of their website. Their new technical data sheets follow Construction Specifications Canada ProductFormat, currently the only published standard for building product data sheets. All the pieces were designed and coordinated for greater consistency of information, more consistent branding, and better accessibility of data. All of the sales collateral recognized by the award was created by Chusid Associates. Ceilings Plus produced a highly innovative way to present their product data and samples. The Idea Box is a formed aluminum box decorated by precision perforation, made in the Ceilings Plus factory. Inside it are elaborate samples of the company's finishes and forming abilities, as well as the Idea Pad, a handbook-sized product catalog full of surprises. The cover of the Idea Pad is a steel sheet with magnetized sample-chips of wood and metal finishes on it. The chips are cut into unusual geometric shapes that can be arranged in patterns including complex tessellations, inviting architects to play with designs and turn loose their imaginations. The book includes not only product and company information, but suggested tessellation patterns, luscious project shots, and space to sketch designs. The Idea Box and its contents were conceived and designed by Chusid Associates, with art direction by Vladimir Paperny and copy by Michael Chusid. The effectiveness of publicity is notoriously difficult to quantify, so anecdotal evidence of how it works is very valuable. We believe that publicity not only gives manufacturers great venues for explaining a product in depth, but also can establish a manufacturer as an authority on the subject, and a thought-leader in the field. One of our clients just got a bit of direct experience in just how it works. We placed and wrote an article, published in February, 2011, in a magazine with a strict “non-proprietary content” policy. This meant we could not name our client’s company or product in the article, we could only explain the problems his product solves and how it solves them. However, our client was on the byline of the article. In June, he received an inquiry from a large contractor specializing in an area where our client’s product could be used. The writer had admired the article enough to make all his project managers read it. More importantly, he invited our client to collaborate with his company, as an expert, in trying to change an outdated industry standard that was blocking use of our client’s product. The article didn’t lead directly to a sale, but it led to an opportunity to open up an entire area of the industry. What questions do you hear most frequently from your customers? What issues are common during installation of your product? What troubleshooting and "how to" tips can you pass along to openings professionals and end users? Doors & Hardware magazine is currently looking for manufacturers in our industry willing to write 1-2 page "How to..." or "Troubleshooting" articles to help answer and address those common industry-related questions. If you are interested in submitting an article for an upcoming issue, contact Chusid Associates for assistance in writing and placing your story.